The Off-Broadway League have announced the nominees for the 31st Annual Lucille Lortel Awards for Outstanding Achievement Off-Broadway. Congratulations to MICHAEL C. HALL and SOPHIA ANNE CARUSO who have been nominated for their performances in LAZARUS, written by DAVID BOWIE and ENDA WALSH, directed by IVO VAN HOVE. - Michael C. Hall, Lazarus. - Maurice Hines, Tappin' Thru Life. - Michael Luwoye, Invisible Thread. - Steven Pasquale, The Robber Bridegroom. - Sophia Anne Caruso, Lazarus. - Alison Fraser, First Daughter Suite. - Annette O'Toole, Southern Comfort. - Mary Testa, First Daughter Suite. The Lortel Awards will be presented on Sunday, 1st May at NYU Skirball Center. 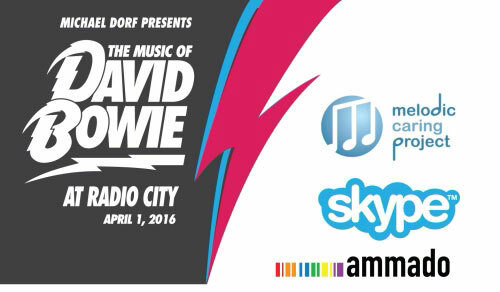 The Music of DAVID BOWIE memorial concert on 1st April at Radio City Music Hall is to be streamed live worldwide via SKYPE. The concert organisers have joined forces with Skype and Ammado, and fans who want to watch the show online will be directed to make a minimum donation of £15 (19 euros) to one of a selection of charities for arts, music and education. Check out www.musicof.org for more details. IMAGINE GALLERY in Suffolk are hosting a new GEORGE UNDERWOOD art exhibition which features his new original paintings and limited edition prints. The preview starts on Sunday 3rd April at 12.00 - 4.00 pm, and George will be attendance. Address: Hall Street, Long Melford, Suffolk, CO10 9JQ, England. The exhibition runs until Saturday 7th May. For more details and information, please visit the imaginegallery.co.uk website. Update: George will be appearing on BBC Breakfast TV tomorrow morning talking about this upcoming exhibition. In December 1992, photographer NICK KNIGHT shot DAVID BOWIE for the cover of his Black Tie White Noise album, which was released in April 1993. Another image from the session appeared on the cover of Arena magazine's Spring/Summer 1993 (May/June) issue. As with all his shoots, Knight filmed proceedings for his archive. As part of this SHOWstudio series, the video is made available for the first time. Nick Knight's assistant at this time was CRAIG McDEAN, who was about to make giant leaps in his photographic career. Craig had left Middlewich for London and was a huge Bowie fan. He is now based in NYC and one of the leading fashion photographers in the world. Published now 17th March was 10th April is THE RISE OF DAVID BOWIE, 1972-1973 by MICK ROCK as a 'Standard Taschen Edition'. You've all seen the deluxe and collectors' editions of this amazing book, and probably like me salivated over it, whilst counting up your pennies. The good news is this standard edition is CURRENTLY priced at only £32.49 GBP if you PURCHASE NOW you SAVE 35%! - (RRP: £49.99). 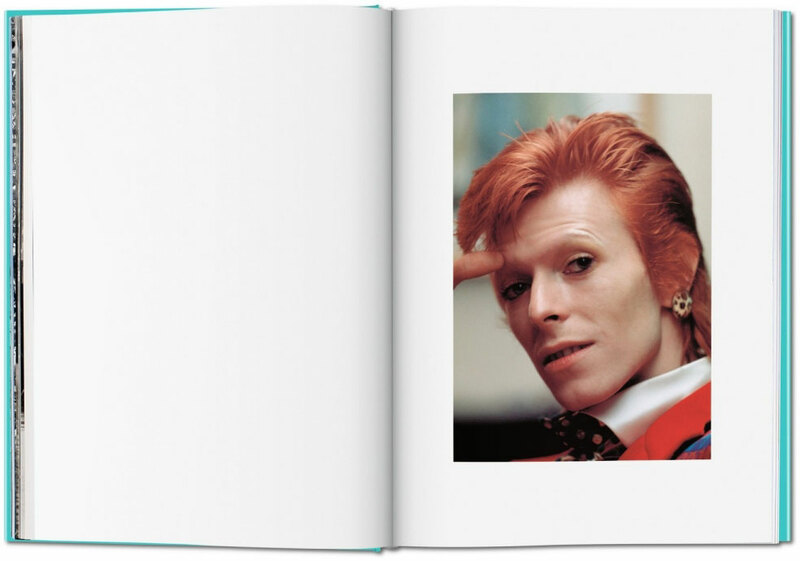 Hardcover: 310 pages / Published by Taschen GmbH / Lenticular Cover (5 images) / Standard Edition / Language: English. In 1972, David Bowie released his groundbreaking album The Rise and Fall of Ziggy Stardust and The Spiders From Mars. With it landed Bowie's Stardust alter-ego: A glitter-clad, mascara-eyed, sexually-ambiguous persona who kicked down the boundaries between male and female, straight and gay, fact and fiction into one shifting and sparkling phenomenon of 70s self-expression. Together, Ziggy the album and Ziggy the stage spectacular propelled the softly spoken Londoner into one of the world s biggest stars. A key passenger on this glam trip into the stratosphere was fellow Londoner and photographer Mick Rock. 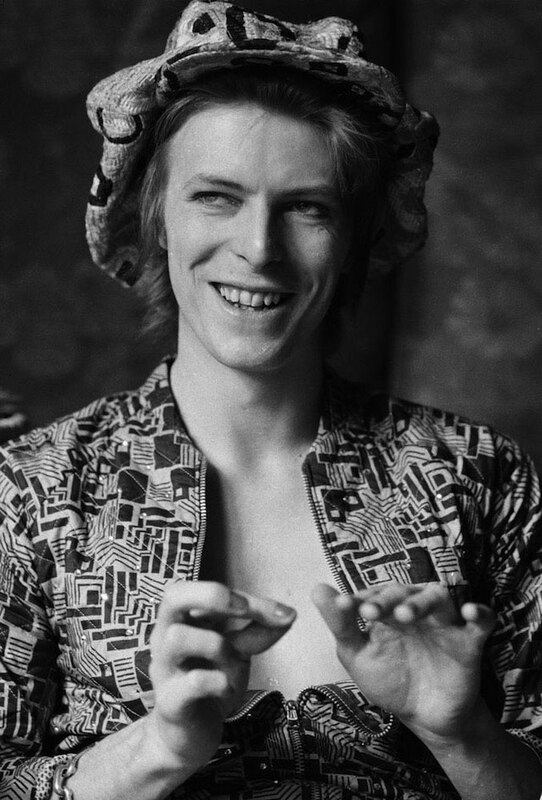 Rock bonded with Bowie artistically and personally, immersed himself in the singer s inner circle, and, between 1972 1973, worked as Bowie's official photographer. This book brings together the best of Rock's Bowie portfolio with spectacular stage shots as well as intimate backstage portraits. 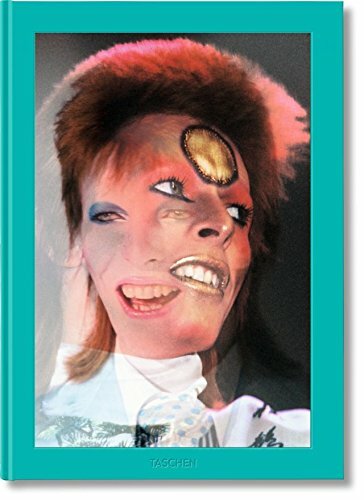 With a lenticular cover of different head-shots, the book stands to celebrate Bowie's fearless experimentation and reinvention. Inside, pictures for press, album jackets, and stills from promo movies sit alongside around 50 percent previously unpublished images, offering privileged access to the many facets of the Bowie's personality and fame. Through the aloof and approachable, the playful and serious, the candid and the contrived, this is a passionate tribute to an oustanding artist, unique creative vision, and eternal inspiration. 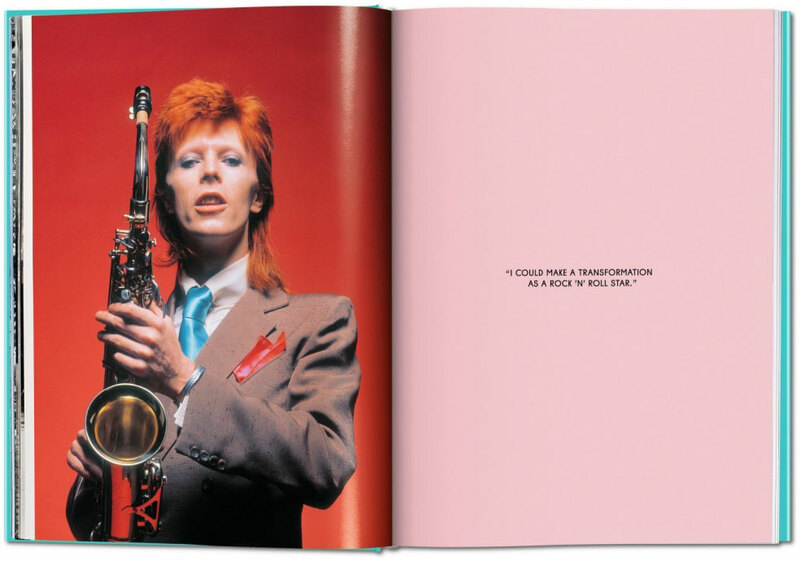 Photographs by Mick Rock, authors Barney Hoskyns and Michael Bracewell, editor Reuel Golden. 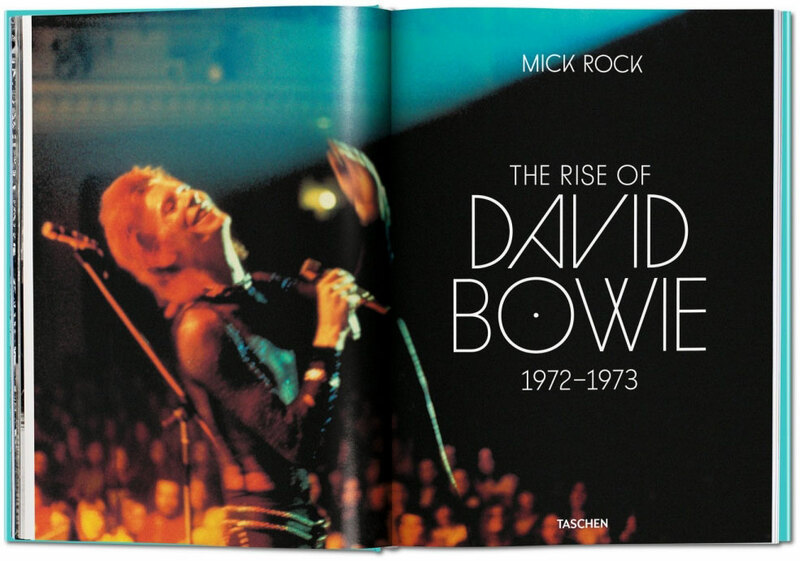 This STANDARD edition of The Rise of David Bowie, 1972-1973 by Mick Rock is available to purchase NOW! SAVE 35%! - £32.49 (RRP: £49.99) - you save a massive £17.50 (35%). 'TO BE LOVE' DEMO UNEARTHED? The HUFFINGTON POST have published a story about a previously unknown DAVID BOWIE demo recording of a song entitled: 'To Be Love'. In February 1971, David arrived in Los Angeles and worked on some demo tapes which would hopefully gain him a recording contract with a major label. Sound engineer RON DE STRULLE is interviewed for the article and tells the story of how this all came about. Recorded at Roxbury Road Studios in the Hollywood Hills, de Strulle and his partners Tom Ayers and Aynsley Dunbar were in contact an executive at United Artists who asked if they could host "a new talent from across the pond who was beginning to make a big stir"
The song, 'To Be Love' written by Ron de Strulle, was the first that David recorded during the two-week trip. Read the full article and backstory to this recording via huffingtonpost.com website. The DAVID BOWIE mural in BRIXTON is to be protected by local listing as Lambeth Council considers a permanent memorial. The mural painted by JAMES COCHRAN (aka Jimmy C) back in 2013, located on the side of Morley's department store on Tunstall Road, is still attracting visitors. Lambeth Council has now announced that the mural will be protected by a local listing and that they are also "considering" renaming the area. Councillor Elizabeth "Lib" Peck said: "It is ultimately the family's decision as to what may be appropriate. We must respect that and be patient. Lambeth residents have been overwhelmed by the outpouring of affection visibly demonstrated by floral tributes, messages and people visiting the Bowie mural to pay their respects to this unique 'Brixton boy'." Lambeth said that their street-cleaning team has been working to maintain the floral tributes at the site, but the last remaining flowers will be removed next week. On Saturday 11th June the HOUSTON SYMPHONY pay tribute to DAVID BOWIE with a special performance at Jones Hall, 615 Louisiana Street, Houston, Texas, US. Tickets for this event go on sale Friday 8th April via the houstonsymphony.org website. This Summer Series opener is a poignant celebration of the artist's unforgettable sounds. Join frontman Brody Dolyniuk, Brent Havens, conductor, the Houston Symphony, along with a full rock band on a stunning musical odyssey that showcases the incredible range of Bowie's astounding career. Watch and listen to the TONY VISCONTI Keynote speech from SXSW Music 2016 in Austin, Texas. 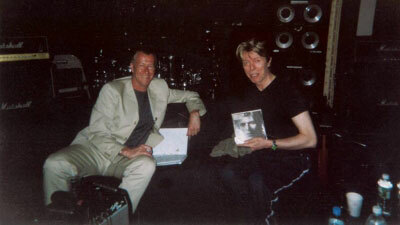 In case you missed this back in January, JOHN WILSON talks to DAVID BOWIE in New York. This is an uncut version of the interview which was first broadcast on Radio 4's 'Front Row' on Friday, 7th June 2002. About SXSW: Started in 1987, South by Southwest (SXSW) is a set of film, interactive, and music festivals and conferences that take place early each year in mid-March in Austin, Texas. SXSW's original goal was to create an event that would act as a tool for creative people and the companies they work with to develop their careers, to bring together people from a wide area to meet and share ideas. That continues to be the goal today whether it is music, film or interactive technologies. 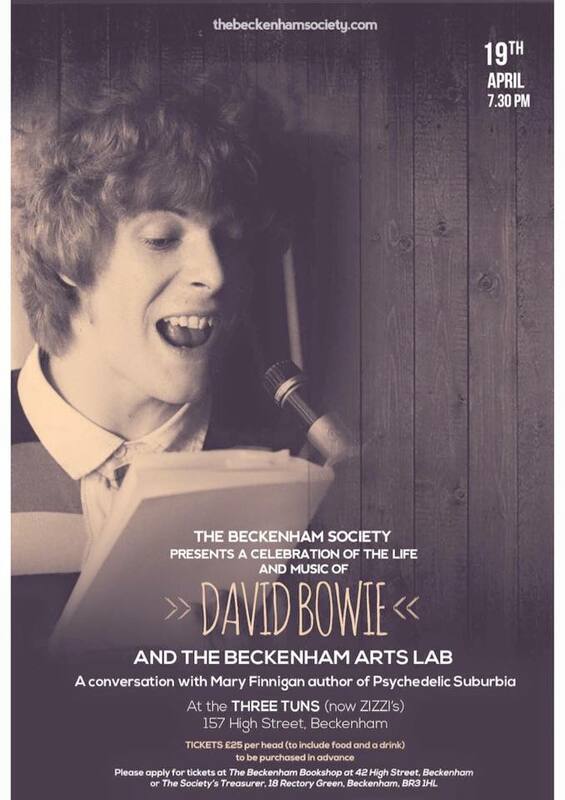 Taking place next month on Tuesday 19th April, The Beckenham Society presents A Celebration of the Life and Music of DAVID BOWIE and The Beckenham Arts Lab at 7.30pm. A conversation with Mary Finnigan, author of Psychedelic Suburbia at Zizzi's (formerly The Three Tuns) located at 157 High Street in Beckenham. Tickets are £25 per head, which includes food and a drink to be purchased in advance. See flyer for ticket information. DAVID BOWIE is to be honoured at the CFDA AWARDS 2016 (Council of Fashion Designers of America). David will posthumously be given the Board of Directors' Tribute. The 2016 CFDA Fashion Awards will take place on Monday, 6th June in New York City. The annual event recognises the outstanding contributions made to American fashion by individuals from all areas of the industry and related arts, with awards being given for design excellence in womenswear, menswear, and accessories as well as extraordinary accomplishments in journalism, creative vision, and lifetime achievement. More details and information can be found over at cfda.com website. Update: D Head XLV realised an incredible £22,500 GBP today at auction. The buyer is a film and television producer who wants to remain anonymous. 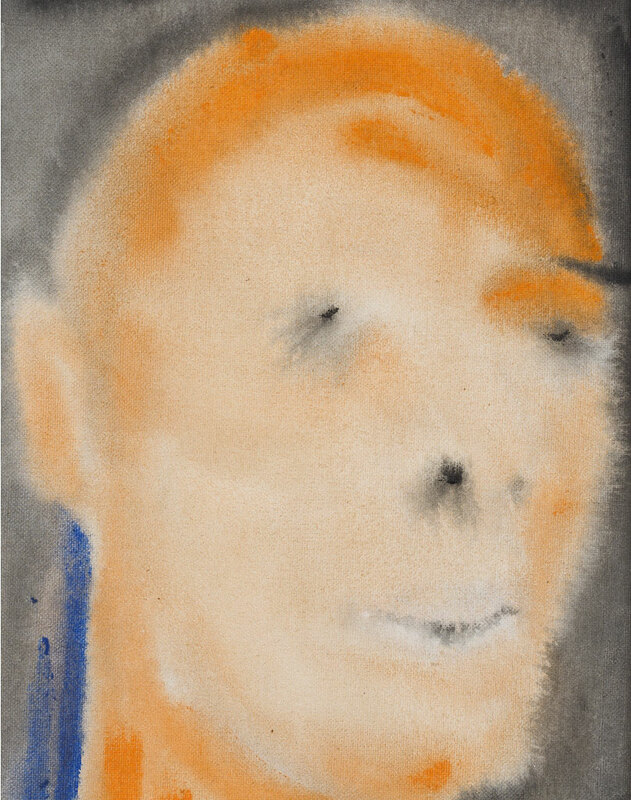 One of DAVID BOWIE's 'D Head' series of art is currently at auction via LYON & TURNBULL Auction House. Their 'Contemporary & Post-War Art' auction takes place on Wednesday 16th March at 11 a.m. The piece entitled: D HEAD XLV (lot 65) has an estimate of £3,000 - £5,000 GBP. The artwork is signed with initials and dated '97 verso, acrylic and computer collage on canvas, size 26cm x 20.5cm (10.25in x 8in). The piece was donated by David to the ArtAid '98 fundraising exhibition for Crusaid Scotland held at The City Art Centre, Edinburgh, Scotland in March 1998. For more details, viewing catalogue and bidding information, please visit the auctions.lyonandturnbull.com website. The Beckenham Bandstand is now indelibly linked with DAVID BOWIE. He performed on it at The Free Festival, wrote a song about that festival which ended up on his second 'David Bowie' album (aka Space Oddity), and wrote 'Life On Mars?' on the steps of this bandstand. However, the bandstand has unfortunately fallen into disrepair and now requires funds for restoration. Following David's incredibly sad passing, the bandstand is now a focal point for tributes. As David had always supported emerging artists, I believe that getting this bandstand repaired and ensuring its long term survival would be a suitable tribute. It would provide a platform for future generations of musicians to perform on and in doing so would allow audiences to continue to enjoy live music in the park. It's also a unique Victorian bandstand, now the only one of its kind, so was already worthy of saving irrespective of the amazing cultural and musical legacy it carries. So please spread the word and do consider donating to this worthwhile cause with any amount you see fit. Once the Bowie Bandstand is repaired there will be a celebratory opening party and surely many future festivals to look forward to. 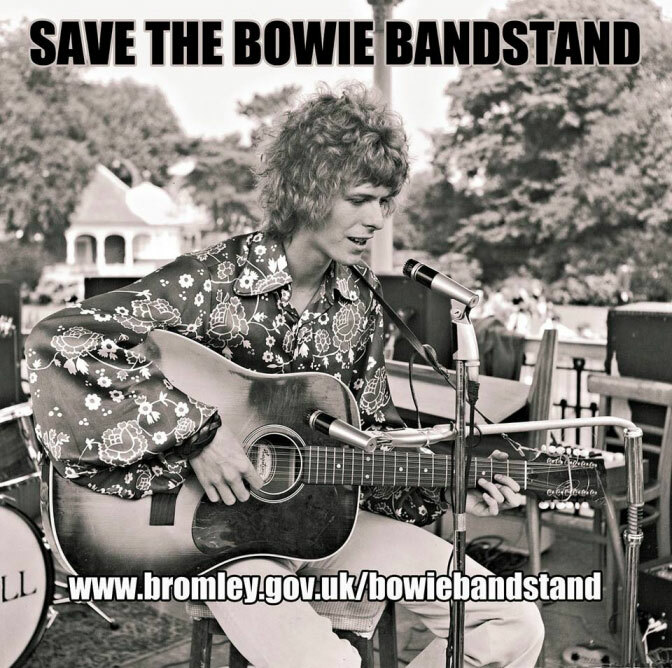 History will recall that it was Bowie's fans both near and far who generously donated to get this unique Victorian bandstand restored to its former glory. From Roger B at Bromley Bowie FB page. Mike: "I did this live Periscope broadcast on March 12, 2016 to celebrate the life and work of my friend, David Bowie. I shared some memories, answered your questions and played a special live rendition of Space Oddity. I was fortunate to have some of the tracks from the original Space Oddity recording. With that, we put together a video montage of memories of David and I through the years. I'm playing piano live in this performance and there are moments in the piece where it's just David's voice singing and me playing which obviously had never occurred before today. This is just a small part of what I'm developing for performance of David's music, our friendship and collaboration over the years for performances in the near future. I hope you enjoy." The second of several film props from the UNBOUND: A ★ INSTAMINISERIES is now available on eBay for bidding. This second auction is for a Welbilt Golden Sounds Collectors Radio Model 1933 CR AM/FM Cassette Radio used as an on-screen prop and has been provided by the producers and writer of the series. This radio is a replica of the old-fashioned "cathedral" radios popularised by companies like Philco in the early days of radio. The radio receiver and controls all work. We were unable to test the cassette player due to lack of cassette tapes! 'Unbound' is a series running now and available through the Instagram account InstaMiniSeries. The 16-episode series, sanctioned by DAVID BOWIE in the Fall of 2015, is a journey of evocative images inspired by the moods suggested by the music, lyrics and artwork from the last studio album released in the artist's lifetime, ★ (pronounced 'Blackstar'). The series is a visual interpretation of the album as opposed to a literal, linear narrative. Each episode has been met with curiosity and intense speculation by viewers worldwide as to the overall meaning of the series. 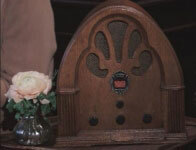 The radio will be shipped with the photo shown, which is of a scene from UNBOUND showing the item on-screen. In addition, a signed letter from series producer Lawrence Peryer will be included, describing the date and context for the prop in an effort to provide documentation of authenticity. For this second auction, the producers have chosen to benefit Memorial Sloan-Kettering Cancer Center in New York City. For more details and information, check out this second eBay listing. Update #2 The radio sold for £309 with 21 bids. Update: The first auctioned items, for the 3 Blackstar books currently stand at $560 US with 49 bids and 1 day remaining. Published next month on 10th April is THE RISE OF DAVID BOWIE, 1972-1973 by MICK ROCK as a 'Standard Taschen Edition'. This STANDARD edition of The Rise of David Bowie, 1972-1973 by Mick Rock is available to order NOW! Purchase now and SAVE 35%! - £32.49 (RRP: £49.99) - you save a massive £17.50 (35%). The stage play FROM IBIZA TO THE NORFOLK BROADS will perform at Waterloo East Theatre in London SE1, from 18th October through to 6th November. Written and directed by Adrian Berry, this DAVID BOWIE themed play featuring the man's music, tells the story of a Bowie-obsessed adolescent. Venue: Waterloo East Theatre, Brad Street, London SE1 8TN. Box Office: 020 7928 0060. After its run at Waterloo East, the play will then tour across the country through to December. More details and information can be found on their Facebook page. Update: Tickets are now on sale - [More details]. Opening tomorrow is 'BOWIE BEFORE ZIGGY - Photographs by MICHAEL PUTLAND' in Bologna, Italy. The exhibition at ONO Arte Contemporanea runs from from Saturday 12th March through to Saturday 30th April. This tribute to DAVID BOWIE through images and memories of the British photographer Michael Putland, recounts a day in the life of the star just before it became Ziggy Stardust. 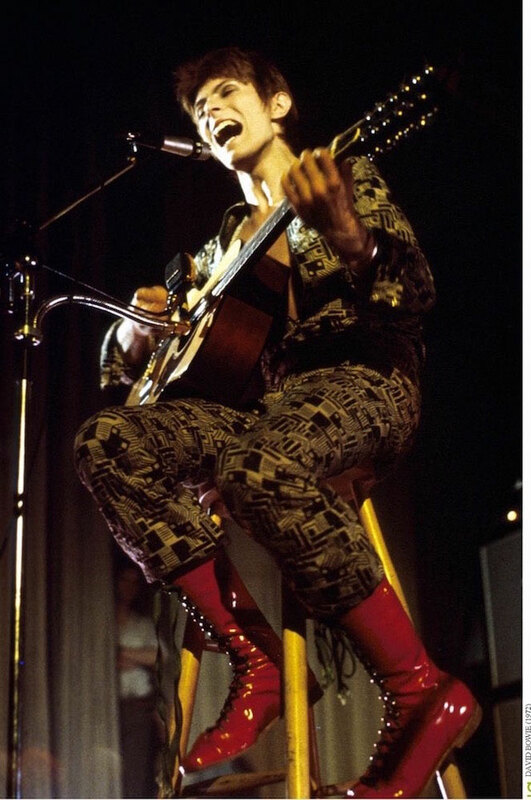 The 27 photographs on display were taken at Haddon Hall on April 24th 1972, when the recording of 'Ziggy Stardust and the Spiders from Mars' had ended a few weeks previously. Alongside the photographs in the exhibition, you can also view some graphic works by TERRY PASTOR, the designer who help create the album covers 'Ziggy Stardust' and 'Hunky Dory'. Address: Via Santa Margherita, 10 40123 Bologna - Italy. Opening Times: Tuesday - Thursday 10-13 and 15-20 / Friday and Saturday 10-13 and 15-21 / Sunday 16-20. Monday closed. More details and information available at the onoarte.com website. The first of several film props from the UNBOUND: A ★ INSTAMINISERIES is now available on eBay for bidding. This first auction is for a set of THREE books created as props for 'Unbound' provided by the producers and writer of the series. These props are handmade and one-of-a-kind. One of the books for auction was used on-screen in several of the episodes of UNBOUND. The other two books are unused mock-ups and prototypes. This auction is for all three books and will be shipped with the photo shown. In addition, a signed letter from series producer Lawrence Peryer will be included, describing the date and context for the prop in an effort to provide documentation of authenticity. For the first auction, the producers have chosen to benefit Memorial Sloan-Kettering Cancer Center in New York City. For more details and information, check out this first eBay listing. Update: The 3 Blackstar books currently stand at $560 US with 49 bids and 1 day remaining. Update #2 The final bid was $620.00 US with 53 bids in total. Basquiat, FLIXe, USA, 12.00pm EST. 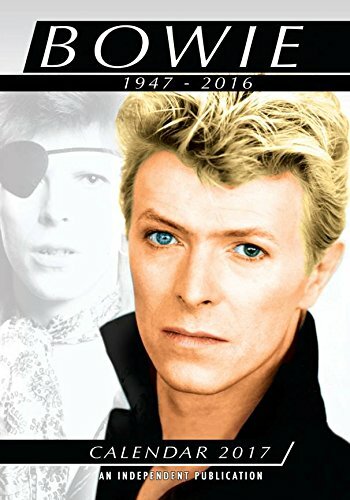 David Bowie Biography (Part 1), ShowBiz, UK, 22.00 GMT. David Bowie: A Reality Tour, Sky Arts and HD, UK, 22.00 GMT. David Bowie: Five Years documentary, Yesterday+1, UK, 21.00 GMT. David Bowie Glass Spider Tour, Sky Arts and HD, UK, 21.00 GMT. Discovering David Bowie, Sky Arts and HD, UK, 23.15 GMT. David Bowie: Five Years documentary, Yesterday, UK, 00.00 GMT. David Bowie: Five Years documentary, Yesterday+1, UK, 1.00 GMT. David Bowie: Serious Moonlight, UK, Sky Arts, 9.00pm GMT. Check out what else is happening for March via the BW Monthly Planner pages. Update: D Head XLV realised an incredible £22,500 GBP. All set for release on 20th May is the 40th Anniversary release of CHANGESONEBOWIE which will be available on heavyweight 180g vinyl in both clear and black colours. There will also be CD and digital formats. For the limited vinyl editions, half will be black and half will be clear. This will not be mentioned anywhere on the LP sleeve, therefore making it completely random as to which one you end up with. 01. Space Oddity (2015 Remastered Version). 02. John, I'm Only Dancing [Sax Version] (2012 Remastered Version). 03. Changes (2015 Remastered Version). 04. Ziggy Stardust (2012 Remastered Version). 05. Suffragette City (2012 Remastered Version). 06. The Jean Genie (2013 Remastered Version). 07. Diamond Dogs (2016 Remastered Version). 08. Rebel Rebel (2016 Remastered Version). 09. Young Americans (2016 Remastered Version). 10. Fame (2016 Remastered Version). 11. Golden Years (2016 Remastered Version). CHANGESONEBOWIE is available to pre-order on vinyl and CD NOW. Release information courtesy of davidbowie.com. Back in May 2007, when DAVID BOWIE curated THE H&M HIGH LINE FESTIVAL in New York, one of the film events that he collaborated on with Cinema Tropical was 'David Bowie Presents 10 Latin American and Spanish Films from the Last 100 Years'. David chose one film from each decade, and his ten favourites were shown at the Quad Cinema, in New York City - (he actually chose eleven films, but that would have ruined the title wouldn't it?). RECORD STORE DAY 2016 takes place on Saturday 16th April - you can now visit recordstoreday.com website to you view all the releases available. 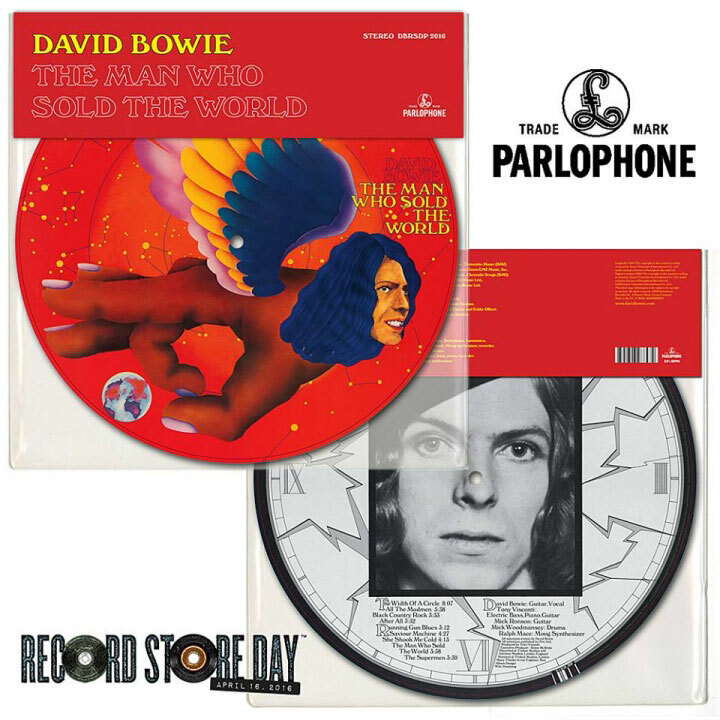 David Bowie - The Man Who Sold The World 12" Picture Disc - 5,000 copies. David Bowie - TVC15 7" Picture Disc - 5,000 copies. David Bowie - I Dig Everything - The Pye Years 1966 - BMG/Sanctuary 12" EP - 7,500 copies - US ONLY. Visit the recordstoreday.com website - choose your country, and see which record stores are participating in this event. All scheduled for a 3rd June release is BOWIE - A REALITY TOUR Limited Edition 3LP Box Set, 180 gram Audiophile in translucent blue vinyl. 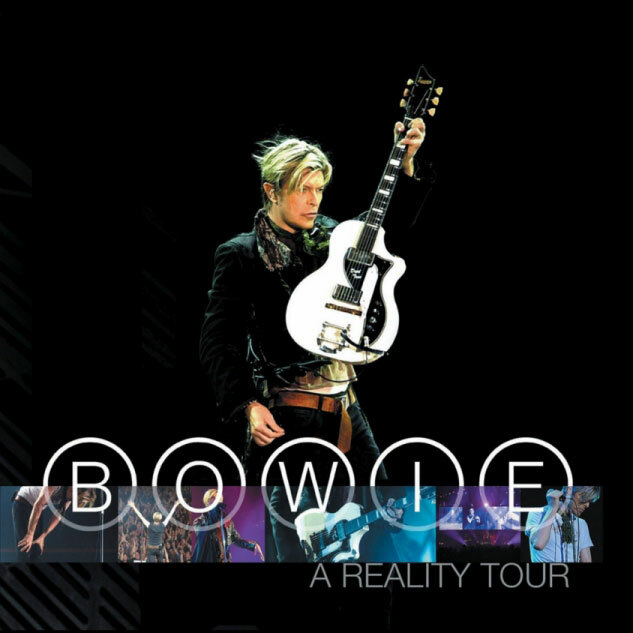 David Bowie's 'A Reality Tour' is an extensive live and final overview of his greatest hits, popular album tracks, along with artist and fan favourites, performed live during his amazing performance in Dublin, Ireland. This 2004 show was captured on film for DVD, later on CD, but never released on vinyl. Featuring almost three hours of music on six sides of audiophile vinyl, mastered impeccably by Joe Reagoso at Friday Music and Capitol Mastering, this limited edition release will be housed in a very handsome sturdy box, with two first-time poster inserts featuring the wonderful 12" x 12" front cover image as well as a 12" x 24" double-sided poster featuring unique live performance shots from this great concert tour. For a very limited time, each LP will be pressed by R.T.I. on translucent blue vinyl, making A Reality Tour a highly collectable David Bowie title. Each LP label will have its own custom David Bowie image, plus there are 3 bonus tracks only found on the CD version of the original release, namely 'China Girl', 'Fall Dog Bombs The Moon' and 'Breaking Glass'. 2. All The Young Dudes. 5. The Man Who Sold The World. 5. Battle For Britain (The Letter). 5. I'm Afraid Of Americans. 2. Bring Me The Disco King. 2. Hang On To Yourself. 4. Fall Dog Bombs The Moon - (bonus track). 5. Breaking Glass - (bonus track). 6. China Girl - (bonus track). Bowie - A Reality Tour Limited Edition 3LP Box Set is available to pre-order NOW. PEDALS AND EFFECTS interview TIM LEFEBVRE and discuss his participation on DAVID BOWIE's last studio album ★. Set to be one of the best records to come out in 2016, Tim sheds light on the recording process and more. In Part Two, Tim goes through the tracks, explaining each bass line's origins, basses played, effects used and so much more. davidbowie.com have exclusively revealed the DAVID BOWIE releases for RECORD STORE DAY 2016. 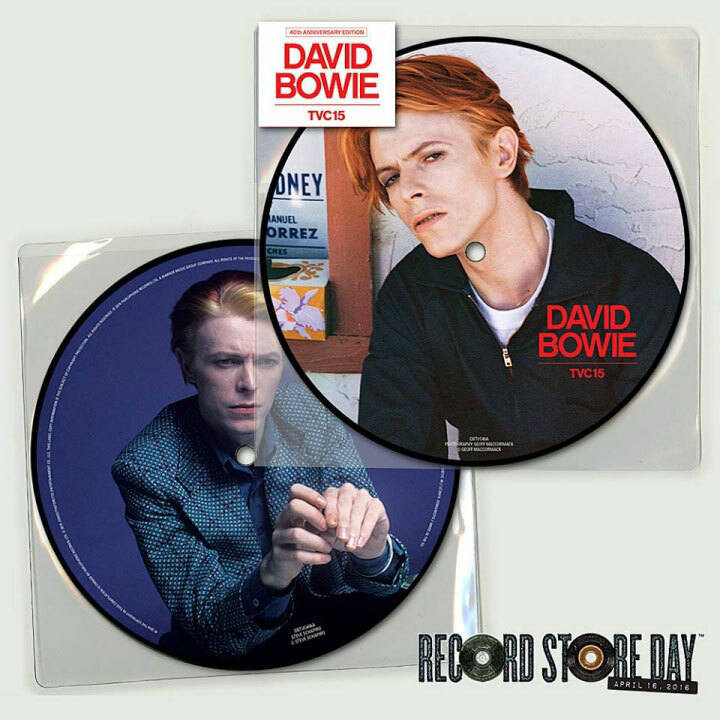 RSD takes place on Saturday 16th April and sees two beautful limited edition David Bowie picture disc releases. TVC15 40th Anniversary Edition 7 inch and The Man Who Sold The World LP which features the German sleeve of the original Mercury "round cover" release. TVC15 Limited Edition 40th Anniversary 7 Inch Picture Disc. A-Side: TVC15 (Original Single edit). Produced by David Bowie and Harry Maslin. Recorded at Cherokee Studios and Record Plant Studios, Los Angeles, US. AA-Side: Wild Is The Wind (2010 Harry Maslin mix single edit). Recorded at Cherokee Studios, Los Angeles, US. Remixed by Harry Maslin 2010. Visit davidbowie.com for the full low-down. Update: Also just announced via davidbowie.com is the 40th Anniversary release of CHANGESONEBOWIE on 20th May via Parlophone. The album is to be reissued on 180g heavyweight vinyl, CD and digital formats. Interestingly, half of the limited vinyl will be black while the other half will be clear, this will not be mentioned on the sleeve so it will be completely random as to which one you end up with. 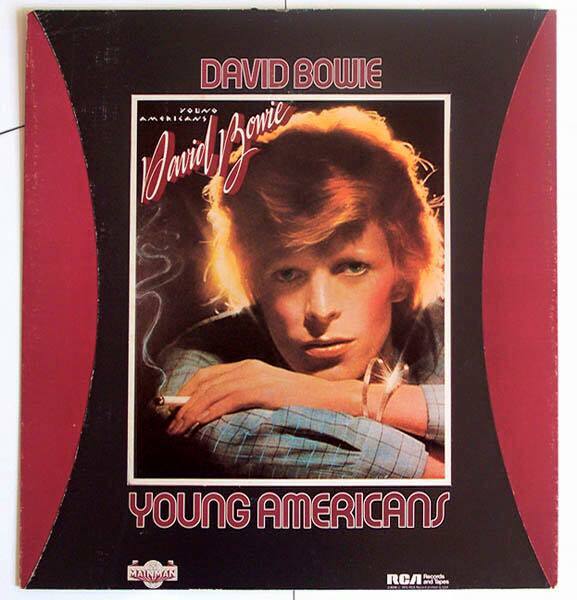 On this day, 41 years ago, DAVID BOWIE released his 'Young Americans' album in 1975. Recorded primarily at Sigma Sound Studios in Philadelphia, Pennsylvania in August 1974, it was agreed early on to record as much of the album as possible live, with the full band playing together, including David's vocals, as a single continuous take for each song. There were no fewer than 7 different "working" titles for the album mentioned in the press at the time, including: 'Shilling The Rubes' (which is circus slang for taking money off people), 'The Gouster', 'Somebody Up There Likes Me', 'One Damn Song', 'Fascination', 'Dancin', 'Young American'. 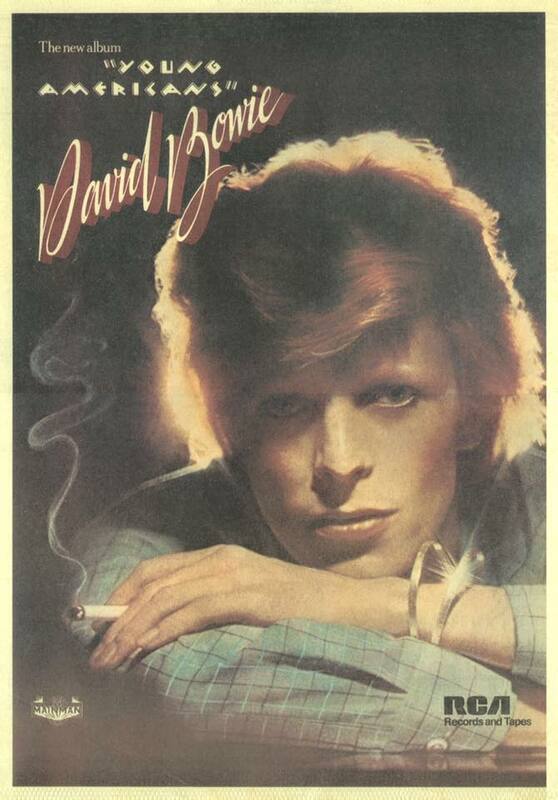 For the album cover artwork, Bowie initially wanted to commission Norman Rockwell to create a painting, but retracted the offer when he heard that Rockwell would need at least 6 months to do the job. The album's cover photo was eventually taken in Los Angeles on 30th August 1974, by Eric Stephen Jacobs. 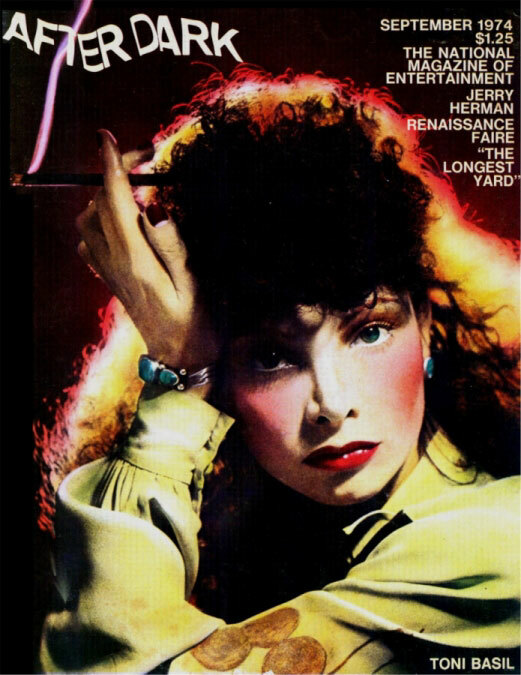 The inspiration for the cover came from a copy of After Dark magazine (September 1974) which featured another of Jacobs' photographs of Bowie's then choreographer Toni Basil. An absolute "must watch" is this new documentary about the recording studios in Philly - Bowie Hard Rock 03.02.16 from Visual Innovations, Inc. on Vimeo. In the latest UK Official Vinyl Albums Chart Top 40 published yesterday, DAVID BOWIE dominates the top 10. There are SIX placements in the Top 10, and nine placements in the Top 30. 04. Bowie At The Beeb Limited Edition Deluxe Vinyl Box Set. 13. David Bowie (aka Space Oddity). 4. Best Of Bowie / 15. Nothing Has Changed / 17. ★ / 26. Hunky Dory / 29. The Rise and Fall of Ziggy Stardust and The Spiders From Mars / 49. Aladdin Sane / 74. Bowie At The Beeb / 89. Back In Anger - Live (Nine Inch Nails with David Bowie). 3. Best Of Bowie / 11. Nothing Has Changed / 12. ★ / 21. Hunky Dory / 24. The Rise and Fall of Ziggy Stardust and The Spiders From Mars / 42. Aladdin Sane / 61. Bowie At The Beeb / 71. Back In Anger - Live (Nine Inch Nails with David Bowie) / 84. The Man Who Sold The World. 3. Best Of Bowie / 11. Nothing Has Changed / 12. ★ / 17. Hunky Dory / 20. The Rise and Fall of Ziggy Stardust and The Spiders From Mars / 32. Aladdin Sane / 47. Bowie At The Beeb / 56. Back In Anger - Live (Nine Inch Nails with David Bowie) / 67. The Man Who Sold The World / 89. "Heroes" / 94. Space Oddity. 33. The Buddha Of Suburbia / 47. Labyrinth. 100. The Many Faces of David Bowie. 6. Space Oddity / 8. Golden Years / 14. Sue (Or In A Season Of Crime) / 16. Fame / 32. Valentine's Day / 38. Love Is Lost. 2. Life On Mars? (Rick Wakeman charity single #1 last week) / 9. Space Oddity / 12. Golden Years / 27. Sue (Or In A Season Of Crime) / 29. Fame / 45. Valentine's Day / 56. Love Is Lost / 88. Knock On Wood. To view all the latest worldwide album chart positions for the ★ album - [View here]. 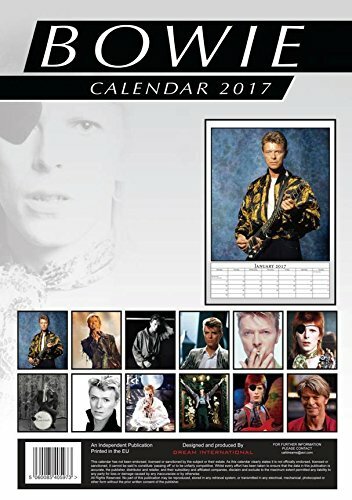 Quite a way off yet, but here's the heads-up on a DAVID BOWIE 2017 wall calendar to be published via Dream. As you can see, there are photographs from: 1991 Tin Machine promo, 2003 A Reality Tour, 1987 Never Let Me Down promo, 1984 Loving The Alien promo shot, 1995 1.Outside promo shot, 1974 Amstel Hotel collecting his Edison Award, 1963 David Jones in The Konrads, 1983 Serious Moonlight promo, 1997 Earthling Tour live shot, 1974 Amstel Hotel, 1974 Toppop Rebel Rebel Dutch TV performance and 2002 NBC Today Show in NYC. An independent publication, A3 size (16.5 x 11.5 inches / 297mm by 420mm), 12 month, 12 photographs, printed on high quality paper and finished to a high standard. Wiro-bound with hanging hook and sealed with an internal board stiffener. Expect it to be published around September time. You can pre-order David Bowie 2017 Wall Calendar NOW. The V&A DAVID BOWIE IS exhibition is visiting the Italian city of BOLOGNA next Autumn at the MAMbo. Bologna is the only stop in Italy, after they beat Milan, the other candidate city. A delegation arrived from London to visit Mambo which was deemed suitable also for its architectural features. The MAMbo - Museo d'Arte Moderna di Bologna is located at Via Don Giovanni Minzoni, 14, 40100 Bologna, Italy. For more details, (press release in Italian) visit ilrestodelcarlino.it website. Back in January, Producer ROBERT FOX announced that the musical production LAZARUS written by DAVID BOWIE and ENDA WALSH would be heading for London. Update: There is now an official Twitter account set up @Lazarus_Musical so you can keep bang up-to-date with news and information. In the meantime, you can sign up at lazarusmusical.co.uk to be informed of any developments. Currently in the pipeline for July is the "unique and personal biographical critique" entitled: THE AGE OF BOWIE written by PAUL MORLEY via publishers Simon and Schuster. 'The Age of Bowie - How David Bowie made a world of difference' is promised to "capture the greatest moments of Bowie's career; from the recording studio with the likes of Brian Eno and Tony Visconti; to iconic live performances from the 1970s, 80s and 90s, as well as the various encounters and artistic relationships he developed with rock luminaries John Lennon, Lou Reed and Iggy Pop", plus discuss in detail his "much-heralded and critically-acclaimed" ★ album. Morley said: "On the day it was announced that David Bowie had died, before there was any time to think, I was asked a hundred times what I thought. What I really thought was that it would take a book to help fully process what Bowie meant to me, to music and popular culture, and to the world out there that changed because of him. Then I thought, I need to write that book." Iain MacGregor, publishing director Simon and Schuster, acquired the world rights (all languages) from David Godwin Associates. S&S will publish the book globally later this year with Gallery Books releasing it in the US simultaneously. 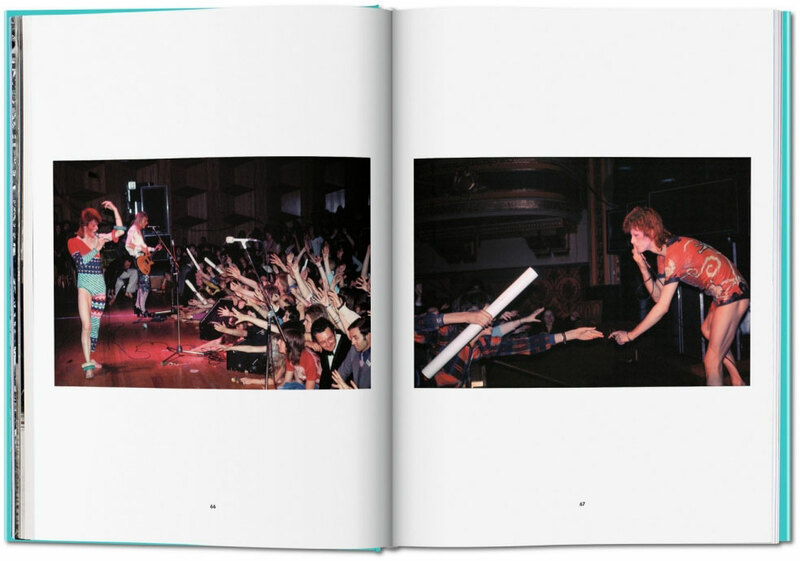 This 304-page hardcover book The Age of Bowie is available to pre-order NOW. The SYDNEY SYMPHONY ORCHESTRA are to pay a musical tribute to DAVID BOWIE with TWO concerts at the Sydney Opera House in Australia. Conductor: Benjamin Northey, with artists: Tim Rogers, iOTA, Steve Kilbey, Deborah Conway, Adalita and Jack Ladder will share the stage at the Sydney Opera House on 19th and 21st May at 8pm. Pre-sale bookings are available through Sydney Symphony Orchestra 9am - 5pm Monday to Friday on 8215 4600 or select your own seat and book online via sydneysymphony.com website. To be published next month on 10th April is THE RISE OF DAVID BOWIE, 1972-1973 by MICK ROCK as a 'Standard Taschen Edition'. 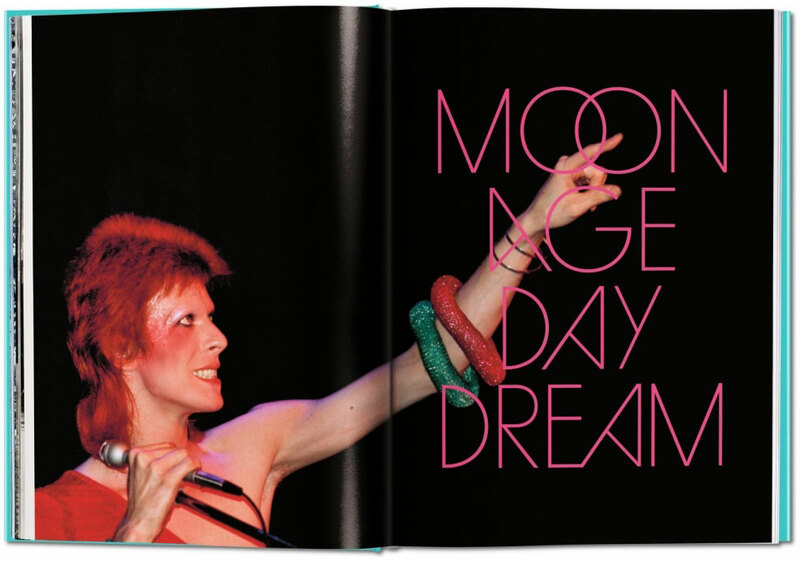 Hardcover: 310 pages / Published by Taschen GmbH / Standard Edition / Language: English. Purchase now and SAVE 35%! - £32.99 (RRP: £49.99) - you save a massive £17.50 (35%). The two-day convention takes place at The Queens Hall, 125 London Road, DERBY, England, DE1 2QQ on Friday 13th May (6pm-2pm) and Saturday 14th May (12pm-2am). Tickets are on sale NOW. Friday only £12... Saturday only £28... BOTH days Weekender £35. Contact Jimster Draper for purchasing tickets via Facebook or email him at or 07856969873. Visit the DB 2016 UK Convention FB page for continued updates. 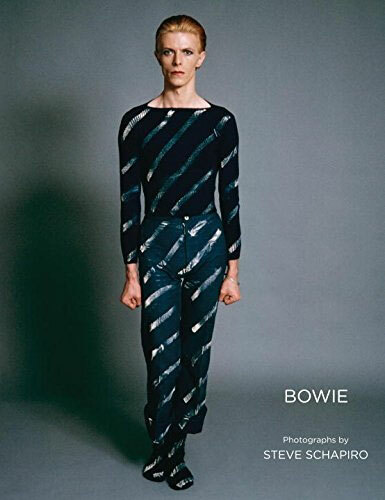 The eagerly anticipated new hardbook book BOWIE - Photographs by Steve Schapiro now has publication date of Thursday 19th May. Synopsis: David Bowie, by 1974, was a man of many faces and as many albums, had already lived the life of Ziggy Stardust and launched Aladdin Sane, with albums Pinups and Diamond Dogs soon to come. A musical force to be reckoned with, Bowie was also widely regarded as a fashion icon, pushing the envelope of sexuality and style and having created an internationally renowned persona. The first photo session started at four in the afternoon and went through the night till dawn. Bowie went through countless costume changes, each more incredible than the last and each seemed to turn him into a totally different person. Bowie relentlessly created these unique characters, each seemingly alive in their own charismatic space for Schapiro to create visual images to complement their very existence and turn them into iconic images for all time. Bowie and Schapiro kidded and laughed about shooting a series of close-up portraits on a putrid green background because they felt it was the worst possible background colour for a magazine, and so they did on this lark - with the image eventually becoming a People magazine cover. The last image they made was at four in the morning to wrap up the marathon session when they went outside to shoot Bowie on his motorcycle - the sun hadn't yet risen and the shot was lit dramatically by only the headlights of a car. This image remains one of Schapiro's favourites and is certain to live on in posterity. This hardcover book contains 76-pages and is published by Powerhouse Books. You can order BOWIE - Photographs by Steve Schapiro NOW and receive a pre-order price guarantee. Black Vinyl - USA - test pressing from RTI Record Technology Inc. (Camarillo, CA, US) - white label/blue letting - November 07, 2015 - Matrix: 88875173871 A/B. Clear vinyl - GERMANY/EU - JPC - 1st pressing - ISO, Columbia and Sony logos - (BC: 88875173871). Clear vinyl - FRANCE - FNAC - ISO, Columbia and Sony logos - (same as JPC) (BC: 88875173871). Clear vinyl - USA - Barnes & Noble Exclusive - sticker on front - 1st pressing - ISO and Columbia logos. (BC: 888751888517). Black vinyl - AUSTRALIA - JB Hi-Fi Exclusive. (no more will be pressed) (US issue). Black vinyl - UK - 1st pressing - 2015. Black vinyl - UK - 2nd pressing - 2016 added. CD - EU - standard digipak (BC 888751 738621) (Cat. 888751 73862). CD - GERMANY/AUSTRIA - MSD Exclusive (Saturn and Media Markt shops) limited edition - 6-panel digipak inside a laminated box includes Blackstar pin. (BC 88751 88762) (Cat: 88875173862). CD - ITALY - Sony Italy/Swarovski limited edition box set (69 only) includes Swarovski crystal encrusted iPhone 6/6s case and CD. CD - JAPAN - Blu-spec CD2 (first press) digipak - obi strip - (Cat. No. SICP-30918). (BC 4547366257106) (New Music Fridays blue sticker). CD - JAPAN - Blu-spec CD2 jewel case - obi strip - (Cat. No. SICP-30918). (BC 4547366257106). CD - JAPAN - Tower Records Exclusive - with promotional plastic folder. CD - AUSTRALIA - digipak - (BC 888751 738621) (Cat. 888751 73862). CD - HONG KONG - digipak - (BC 888751 738621) (Cat. 888751 73862). CD - HONG KONG - HMV - (plus Tote bag edition) (same as above). CD - TAIWAN - digipak - obi - (BC 888751 738621) (Cat. 888751 73862) (disc is EU) (typo on Dollar Days). CD - KOREA - digipak - (BC 8803581123135) (Cat. S20313C) (with promo sheet). CD - ARGENTINA - digipak - (BC 888751 738621) (Cat. 888751 7386-2). CD - BRAZIL - digipak - limited edition of 6,00 copies - (BC 888751 738621) (Cat. 888751 73862) - front cover sticker in Portuguese - CD made in Brazil. CD - MEXICO - digipak - (BC 888751 73862). CD - USA - digipak - (BC 888751 738621) (Cat. 888751 73862) (Cat. #2 88875173862 S1). CD - CANADA - digipak - (BC 888751 738621) (Cat. 888751 73862) (same as US apart from Sony Canada). A couple of things to be aware of: there is also a German MSD Exclusive box with pin, that allegedly has 3 smaller litho prints inside the box - these are home-made prints and NOT official. 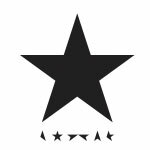 Also be careful when purchasing vinyl first pressings - the second vinyl pressing of ★ has the date 2015/2016 on the back cover and all labels, first pressing is just 2015. Second vinyl pressings seem to be available everywhere now. Happy hunting on the ★ eBay listings and if anyone has any amendments or additions to the above list, do please let me know. All set for release in Japan this month is a limited release of LABYRINTH (Blu-ray Slipcover) Memorial Edition on 23rd March. 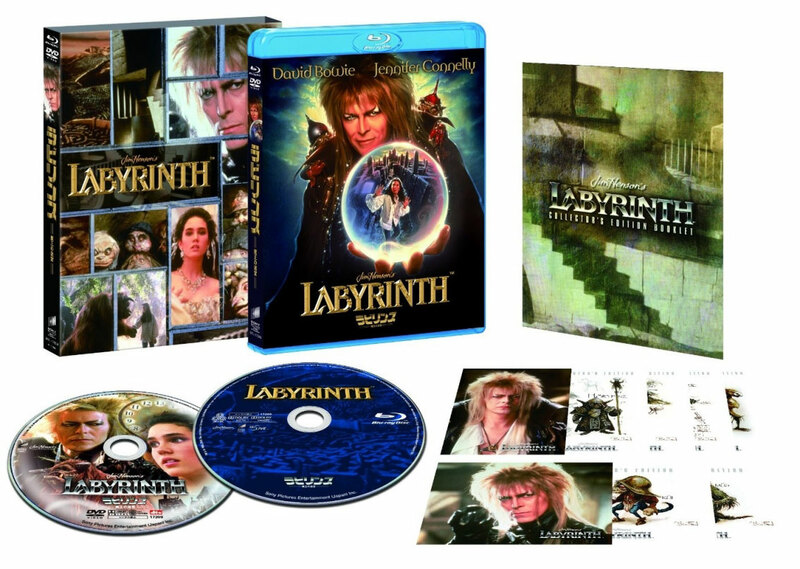 This memorial Blu-ray and DVD set comes complete with replicas of the booklet and postcards (resized, A6: 10.5 x 14.8cm), which were included in Labyrinth that was originally released in 2005. Also includes two new postcards. Features newly designed outer case packaging. Special Feature / Bonus Track: picture-in-picture (bonus view), audio commentary, making-of, photo gallery, storyboards, filmography, and more. Product Type: Blu-ray. / TV Standard: NTSC. / Number of Discs: 2. / Running Time: 101 minutes. / Region: A. / Subtitles: English Japanese. / Audio Track: English 5.1ch Surround and Japanese 5.1ch Surround. 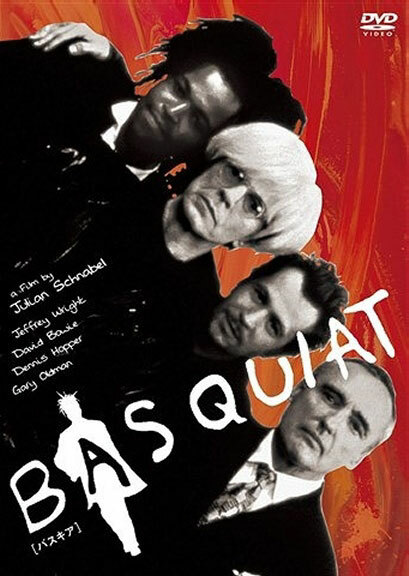 Then next month on 20th April sees the Blu-ray version of BASQUIAT which stars DAVID BOWIE as 'Andy Warhol'. Special Feature / Bonus Track: theatrical trailer. Update: Date now brought forward - New STANDARD EDITION of THE RISE OF DAVID BOWIE, 1972-1973 by MICK ROCK - published on 17th March - you can purchase NOW and SAVE 35%! - £32.49 GBP (RRP: £49.99 GBP) - you save a massive £17.50 (35%). BOWIE AT THE BEEB Limited Edition Vinyl Box Set containing 4 LPs released 26th February - you can purchase NOW. New book ON BOWIE by Simon Critchley to be published 7th April via Serpent's Tail - you can pre-order NOW. 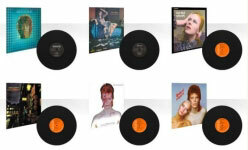 SIX DAVID BOWIE albums vinyl editions released 26th February all heavyweight 180g vinyl: David Bowie / The Man Who Sold The World / Hunky Dory / The Rise and Fall of Ziggy Stardust and The Spiders From Mars / Aladdin Sane / Pinups all can be purchase NOW. DAVID BOWIE brand new album ★ released 8th January - you can purchase the CD version and Vinyl version as well as the digital album download NOW! Japanese only CD digipak first limited edition Blu-spec CD2 of DAVID BOWIE brand new album ★ released 8th January - you can purchase NOW. 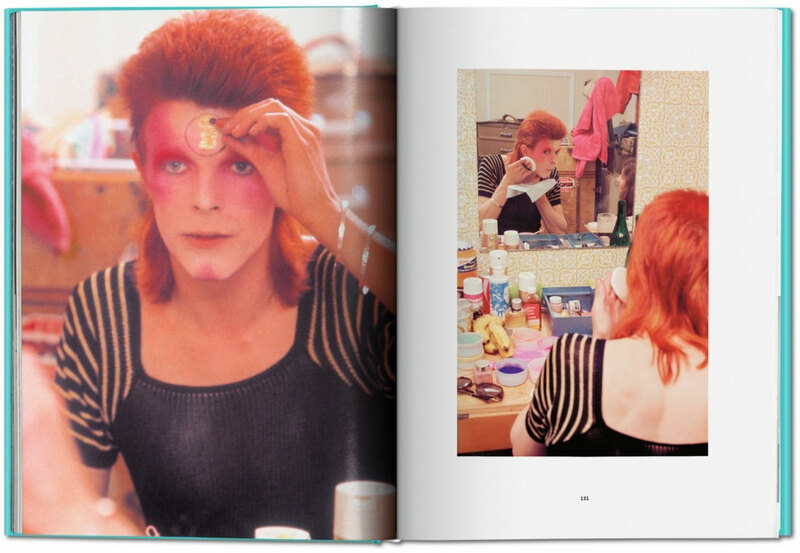 New book BOWIE - PHOTOGRAPHS BY STEVE SCHAPIRO to be published 19th May - you can pre-order NOW. 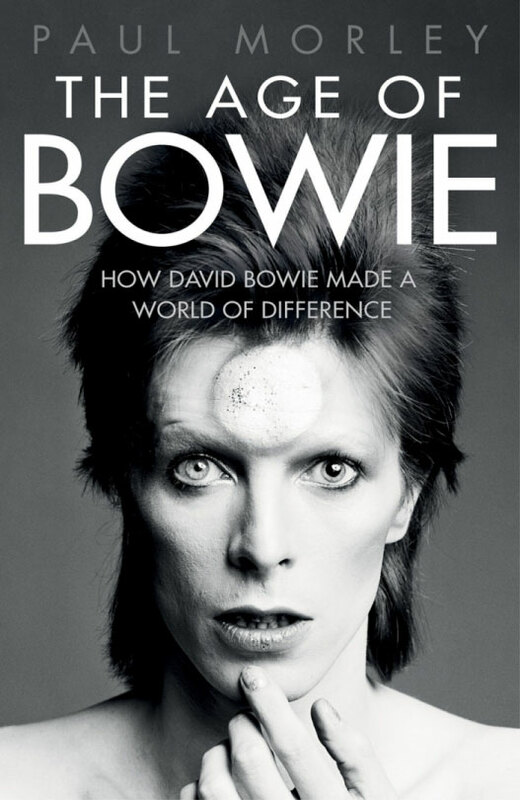 DVD release BOWIE: THE MAN WHO CHANGED THE WORLD released 11th April via Screenbound Pictures - you can pre-order NOW. 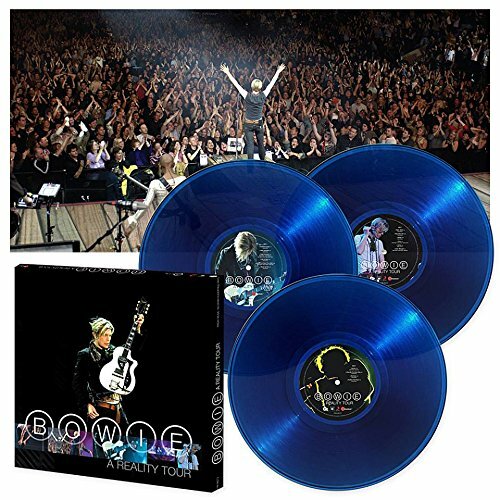 Limited Edition 3LP Box Set BOWIE - A REALITY TOUR 180 gram Audiophile in translucent blue vinyl to be released 3rd June - you can pre-order NOW. 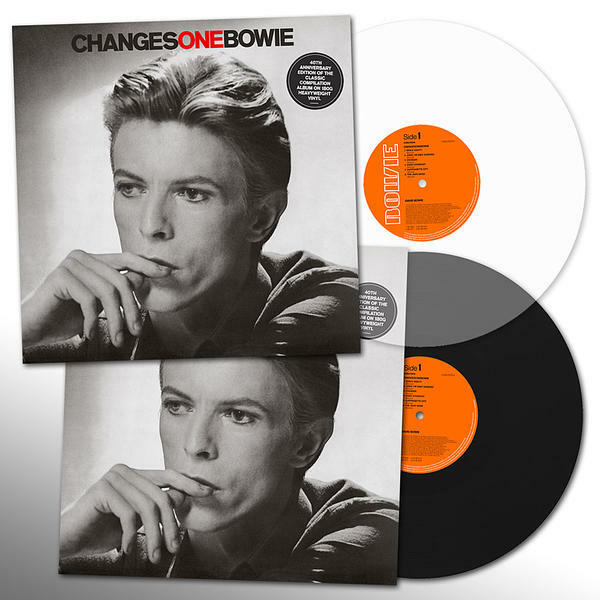 40th Anniversary release of CHANGESONEBOWIE on 20th May available on heavyweight 180g vinyl in both clear and black colours, also CD and digital formats - you can pre-order NOW. Limited Edition 13-Disc Blu-ray Box Set DISSENT & DISRUPTION: The Complete Alan Clarke at the BBC 1969-1989 features DAVID BOWIE in BAAL to be released on 23rd May via BFI. Also available as two separate volumes DVD 5-Disc Box Sets - you can pre-order Dissent & Disruption Blu-ray Box Set NOW. Also Volume 1: Dissent and Volume 2: Disruption (Note: Volume 2 features Baal. There now are two listed release dates: 23rd May and 20th June).